My partner Hugh and I were looking for somewhere special and tranquil to escape the hustle and bustle of the Big Smoke and to celebrate our anniversary. The Bush Hut exceeded all expectations. The Bush Hut caters for those both looking for an active getaway or a relaxing break. Situated on the edge of the Charles Darwin Walk and Conservation Hut, you have the convenience of exploring some of the best Blue Mountains walks, waterfalls and lookouts at your leisure; while the beautifully decorated Bush Hut, with floor to ceiling glass windows and fireplace, provides a serene and homely place to curl up and read a book. The owners are wonderful people and the perfect hosts. They're respectful of your privacy, but are also open to chat and introducing you to their wonderful bird life including 'Mr Bower' and 'Billy' the cockatoo. The lovely little extras that were provided made the stay even more memorable. If you're looking for a charming getaway full of nature and relaxation, then look no further than The Bush Hut! Amazing stay in the beautiful little bush hut surrounded by trees, birds and Wentworth Falls. The place was immaculate. Could not recommend it highly enough. The hosts were so welcoming and warm. We will definitely go back. I'm so happy to have been introduced to The Bush Hut. It superceded all expectations. We were very pleased to find it was private, with beautiful decor and a stunning leafy outlook. The owners were a pleasure to meet and had thought of absolutely everything for our needs whilst staying for the half-week we were there. The stunning location, on the edge of the Charles Darwin Walk just added to the wonderful experience. A small piece of paradise is well worth seeing! My daughter and I had a two night stay in this lovely hideaway. The owners could not have made us feel anymore welcome with thoughtful welcoming touches. Set in the heart of the blue mountains in a very non commercialised area, the bush hut is a perfect base for exploring all the treks in the area. Lots of information to hand and even a ruck sack as we forgot ours!! Plenty of very good restaurants on your doorstep. We would whole heartedly recommend the bush hut. This beautiful place makes you feel like you're in the middle of the blue mountains' nature. Architectural little studio, which has all the charm in the world and large panoramic windows. Waking up and looking out on birds and the nature is amazing. The location is perfect for a quiet getaway, right on the trail of Darwin walk and close to conservation hut. If you're looking for charm, nature, beautiful surroundings and a romantic getaway, this place has it all. This hut is cosy in winter and breezy in summer (we stayed the weekend in October when winter turned to summer). The hut itself is gorgeous, with interior furnishings that are interesting, practical and homely. The hut's many windows bring the outside in, surrounded by private gardens and on the edge of the national park. The hosts are welcoming, wonderful and friendly. They are full of information and passion for the region. 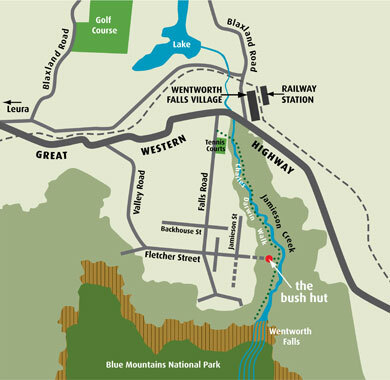 There is an access path right next to the hut to the Wentworth Falls bushwalk which is absolutely spectacular. I highly reccommend The Bush Hut for a weekend getaway or even a longer stay. My partner and I just celebrated our anniversary at the Bush Hut and had the most wonderful experience. The place is so cosy and peaceful and we felt at home straight away. The lovely little extras that were provided for us, such as cake to have with tea, a bottle of wine on arrival etc. were really thoughtful. Fantastic location too, situated right by the start of the Charles Darwin walk, which then leads onto other bush walks such as the National Pass etc. We would gladly stay again, such a beautiful space, were very sad to leave! This place is a rare gem. Incredibly well located at the trailhead for Darwin Walk. It's like an Australian bird reserve overlooking the Blue Mountains. Reasonably priced with great little touches, wood burning fireplace,etc. Beautifully charming. We've been to Australia 6 times. At the top of our list.